Cal Day is here! 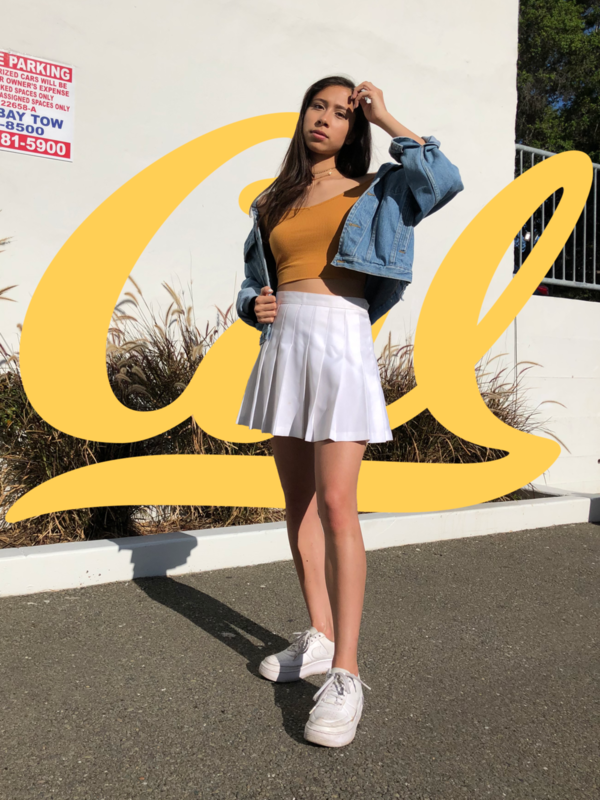 Known for the crowds of uncorrupted children, annoyed parents, and wasted students, Cal Day is a fun opportunity to get creative while sporting our school colors. Read on for some festive outfit inspiration! For my outfit, I tried my interpretation of the classic sratty skirt look. If you’re finding yourself short on festive colors, denim is a super easy way to incorporate blue into your outfit. I paired this white tennis skirt with a bright gold off-shoulder top, a blue jacket to stay warm (and protect the white skirt from stains), and platformed AF1’s. A big, chunky shoe lets you stomp your way through crowds pretty easily, and the leather material resists stains pretty well. If you don’t have any yellow items in your closet, I think white passes as a pretty Cal-related color. Finally, I added some delicate gold jewelry so I could enhance the gold theme and pretend to be more put together. This jacket is from Bouquet + Head West Vintage Market, a biannual vintage fair which I highly recommend checking out if you’re in the Berkeley/Oakland area. The jewelry and shirt are from good ol’ Forever 21, the skirt is the classic tennis skirt from American Apparel, and the shoes are Nike Air Force 1 Jesters. 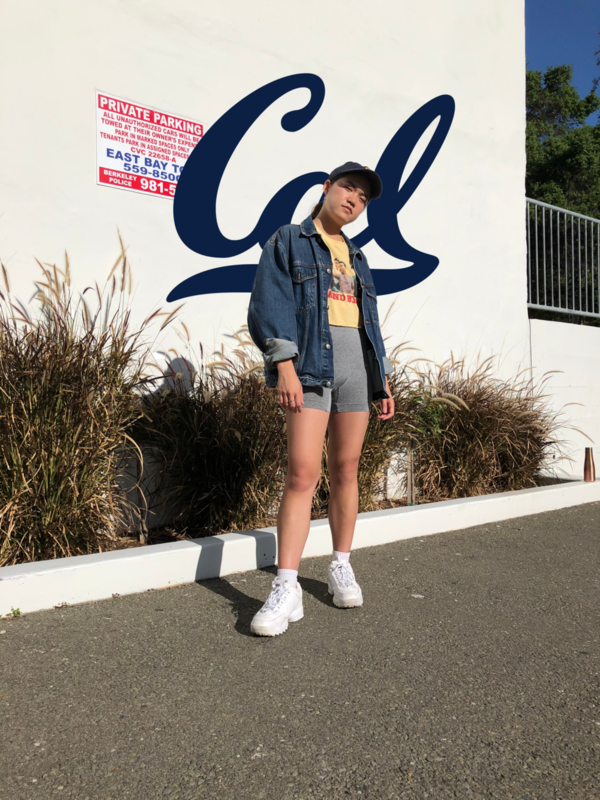 This Cal Day, I decided to switch up the ol’ outfit a bit with a chic, comfy pair of gray bike shorts (thank you Ross🙏) that still give the same effect as your usual tennis skirt or booty shorts! Top it off with a cut up graphic tee (that so happens to rep my school colors as well as my all-time favorite movie, Stand by Me!!). And finally, I finished the look off with my go-to Filas (I swear to god, white sneakers are the move for any look), my thrifted, baggy dark blue jean jacket to loosen up the outfit, and a little Cal gear to adorn the head! Don’t forget to take care of yourself this Cal day, and go bears!! Expand your closet by introducing some of your athletic wear into the mix! The dreaded “business casual” dress code—what the hell does that mean? To be honest, who knows. All I know is that I’ve often found it a chore to figure out my next bland, sort of stuffy business casual look. However, I wanted to explore how the “casual” aspect gives some freedom to wear fun clothes and hopefully inspire you to add some personality into your next professional outfit. Sign up to receive a notification when new posts are uploaded.